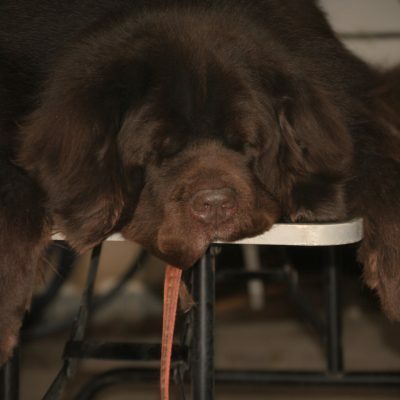 Since a Newfoundland is a double coated breed they require a lot of grooming and a lot of tools to do that grooming. 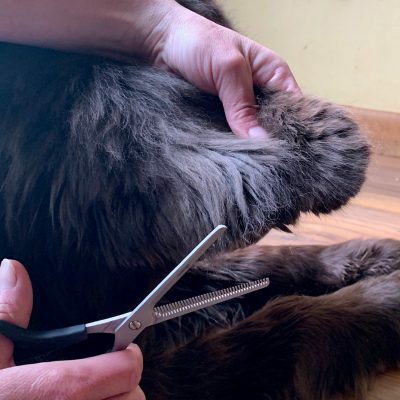 While brushes and combs are important grooming tools that every owner needs, a grooming table is also a tool that Newfie owners should consider even of they are only doing basic grooming in between trips to the dog groomer. 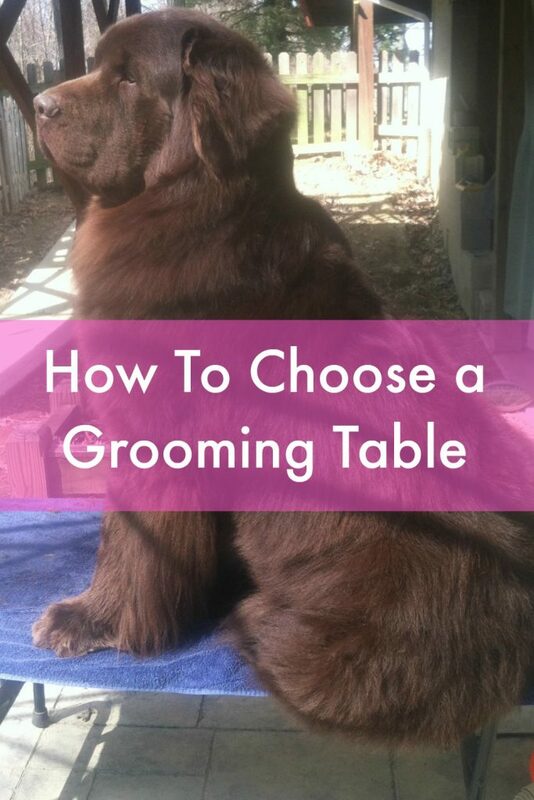 Why Should You Consider A Grooming Table For Your Newfoundland? A grooming table gives your Newfie a place to know that this is where grooming takes place. Instead of grooming on the floor where your dog naps, plays, eats and chills out, the grooming table is the place for business. A grooming table keeps your dog in place. When properly trained and secured, a dog can’t get up and walk away from you when they’re on a grooming table. A grooming table allows you to gets all areas of the dog instead of working on one side or area and then waiting for them to move to work on the rest. A grooming table can help save your back and knees. When the table is set at the correct height, you should be able to groom the dog while standing upright. When you start searching for a grooming table for your Newfoundland you’ll start to realize that not all grooming tables are equal and some may offer features that others will not. A folding grooming table is used by most Newfie owners that are doing basic grooming at home. It’s the most affordable, is lightweight and folds easily for storage or transport. The downside of a folding table is that the height is usually not adjustable which can make it difficult for the dog to get on and off and it can also be difficult for a short person to groom a tall dog. I’m short so with our folding table, we cut a few inches off the legs and then added rubber bottoms to it. We have a 48″ table by Mater Equipment. Hydraulic grooming tables are easily adjustable to accommodate height and make grooming more comfortable for the groomer and the dog. These tables are often more sturdy than folding tables. They can usually be lowered to 1-2 feet off the ground which is easier for a large dog to get up on. With most hydraulic grooming table you use a foot pump to raise and lower it. The downside of these tables is that they don’t fold for easy storage, they are heavy to move, require maintenance and can be loud when adjusting the height. 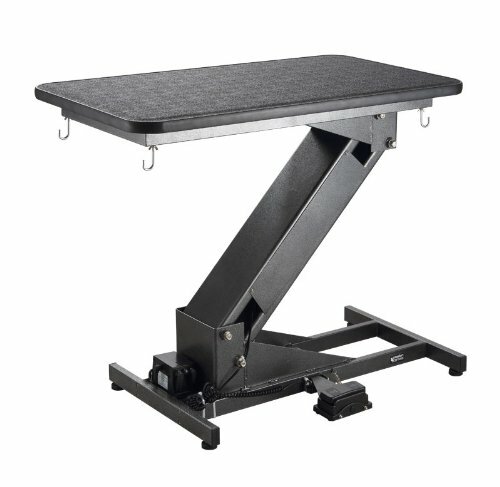 The Z-Lift Hydraulic Grooming Table by ComfortGroom. It has a foot pump, holds up to 500 pounds and adjusts from 21″ to 39″. An electronic grooming table is what most professional dog groomers will use in their shop. These tables easily raise and lower which allows the dog to get on and off the table easily. They are quiet, sturdy and do not require as much maintenance as a hydraulic grooming table. The Z-Lift Electric Grooming by ComfortGroom is an example of a hydraulic grooming table that holds up to 400 pounds. It has a foot remote to easily adjust the table from 13″ to 42″ . You can buy a grooming table for your Newfoundland online from Amazon or other dog online retailers such as Pet Edge or from the manufacturer. Want a grooming table for your Newfoundland but don’t want to invest in one? There are other ways you can do it, although we always recommend that safety for your dog comes first. Many people will use their backyard picnic table as a grooming table. It’s big, sturdy and cleans easily. The downside is that it’s not adjustable and now you have nowhere to eat in the summer. I’ve seen many people use folding tables as a grooming table. It’s quick and easy but it also has a slick surface so you’ll want to make sure that you put something like a yoga mat on the top of the table or plywood with a non-slip mat, and always check the stability before letting your dog on it. Some people have also used hospital beds and made them into grooming tables. You can make a grooming table for your Newfoundland out of a few 2 by 4’s and customize it to a size that works for you and your dog. We are actually making one this spring so we’ll have a tutorial coming soon! Do you need a grooming arm for your grooming table? It is normally recommended to have a grooming arm on your grooming table for the safety of your dog. A grooming arm will keep your dog from jumping off or moving around too much on the table. It will also keep the dog standing or sitting on the table. It’s never recommended to leave your dog alone for even a second when they are attached to the grooming arm. 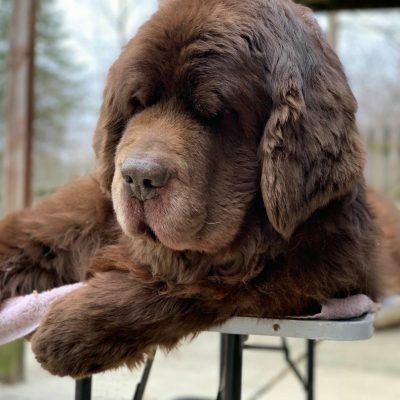 When choosing a folding grooming table for your Newfoundland make sure that you check out the weight limit and don’t get one that is not meant to hold the weight of a Newfoundland, even if it’s less expensive. It’s always recommended to introduce your Newfie to a grooming table and other grooming tools as early as possible. The first day or week that you bring your puppy home is a great time to start. Start in small sessions and gradually build up to longer sessions. Make it a positive experience and reward with praise or treats for good behavior and encouragement. For older Newfs, it’s a good idea to slowly introduce them slowly. 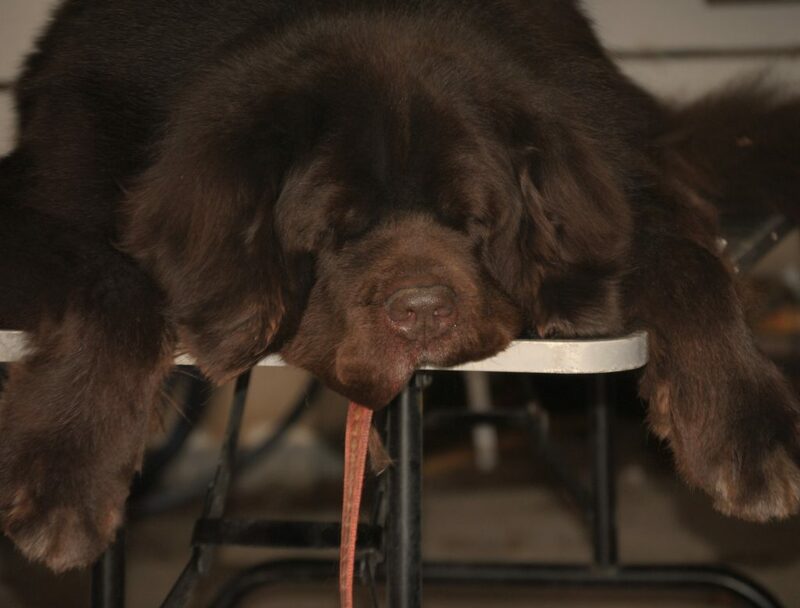 You can start off with leaving the table folded on the ground and having your Newfie get used to it that way for a little bit and then gradually work up to unfolding the table and placing them on it. If you have someone that can be with you for the first few times to offer praise and encouragement, that would be a good way to start. Keep the table sessions short and positive and don’t get discouraged if they don’t take to it right away. Sherman wasn’t a fan of the grooming table at first but he eventually got there! « Do Non-Slip Dog Socks Really Work? It’s so sad the grooming tables I use aren’t available anymore I ordered them over 20 years ago from a company in Arkansas all pieces and part were made in US. They were originally preschool tables I saw them when attending a conference and thought perfect size height for grooming the big boys. We still have and use them, you’ve gotten me thinking Jen need to see if I can get someone to start making them again they are easy to carry easy on off for even older dogs and just the right height that our legs and backs don’t ache as well. What a great idea Pim! A grooming table out of an old pre-school table would be perfect. I wonder if anyone I know from back in the day has one. I’ll have to check around!